Hop in and join Dr. Ralph (alias Air Wolf) on a scenic virtual flight around Nova Scotia. In the fantastic world of cyberspace we will enjoy some spectacular vistas from the air and occasionally land to look at the geology up close and personal. Summary for non-geologists: River Inhabitants in southwest Cape Breton Island (location map) cuts through a gorge of bedrock and glacial deposits over 20 m high. In the river bank at the base of the cliff are large pieces of wood and twigs buried by glacial deposits. The woody layers record the last interglacial period, a time of warm climates between 125,000 and 75,000 years ago. Over the wood layer are beds that record a gradual cooling, starting with slope debris, followed by two layers of glacial deposits, each recording separate ice flows from large glaciers in the Maritime Provinces. We are flying over the Strait of Canso, a glacially overdeepened trough that separates Cape Breton Island from the mainland of Nova Scotia. Glaciers flowed both northwestward and southeastward through this corridor during the last ice age (see maps of former glaciers). Inspired by the pack ice in the Gulf of St. Lawrence, it is interesting to speculate back to the last glaciation. Was the Gulf of St. Lawrence a centre for ice buildup? Evidence from glacial striations and erratics does suggest that the Gulf of St. Lawrence was a major outflow centre during the peak of the last glaciation (20-22 ka) and the location of an ice centre during the Younger Dryas (11-19 ka; ~12.9-11.5 CAL). Glacier inception and nourishment in the lowland plateau of the Magdalen Shelf in the Gulf of St. Lawrence may be a test of the Denton and Hughes (1981) marine ice transgression hypothesis (whitehole) hypothesis. They suggest that glaciers formed first as ice dams in lowland basins plugged landward drainage basins and accreted rapidly by the freezing of surface and ice marginal glacial lakes. J. W. Dawson first described this section in 1855. The stream east and west of the locality is carved into Carboniferous bedrock, except at this section, where it has eroded through a large sediment-infilled channel. The base of the section is characterized by alternating peat and wood layers and organic silty clay, dipping to the west, which are locally folded and boudinaged. The organic zone is overlain by 3-5 m of locally derived, bouldery gravelly sand (colluvium?). Overlying the colluvium are two till units, about 15 m thick, with a lower greyish silty till dominated by grey siltstone and an upper reddish silty till, with 20% red mudstone, and 1-2% whitish granitic erratics. Grant (1994) also found fragments of Mercenaria sp. in the uppermost reddish till. ​Pollen from the basal organic deposits was interpreted by Mott (1971) as a boreal forest assemblage, indicating cooler and wetter climatic conditions. Grant (1994) suggested that these buried peats and soils could range in age from Late Sangamonian (89 ka) to Middle Wisconsinan (49 ka). The few middle Wisconsinan ages obtained in these buried organic horizons, however, are suspect (Stea et al., 1992) due to the strong possibility of contamination by young carbon. The overlying gravelly sand deposit is interpreted as colluvial, largely based on a lack of sorting and a monolithologic character. 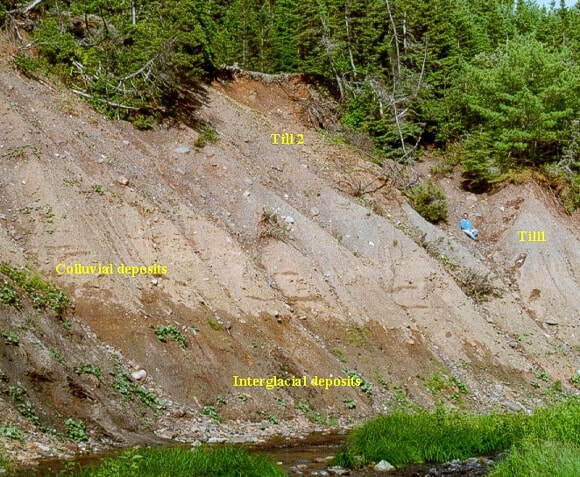 It greatly resembles deposits found in coastal sections along the Northumberland Strait underlying tills, and overlying a wave-cut platform of Sangamonian age (Stea et al., 1992). 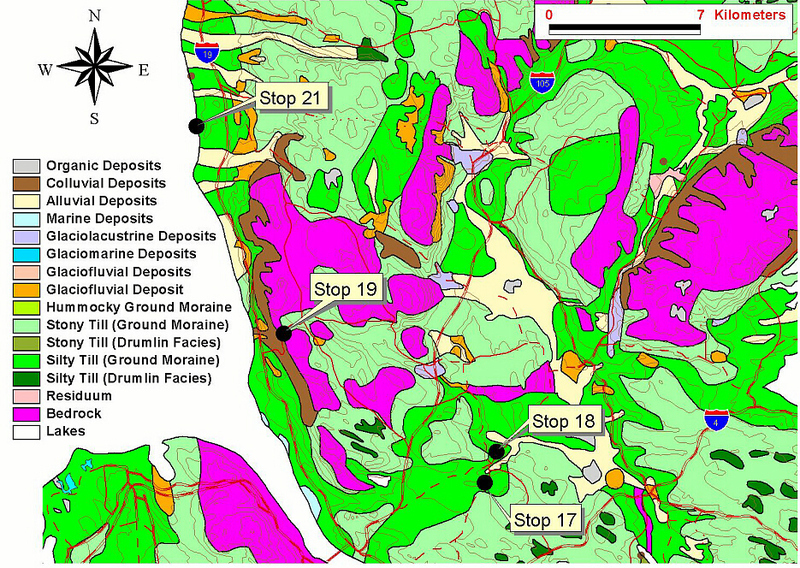 The two till sheets present at the site have been interpreted by Grant (1994) as representing early eastward and southeastward ice flow, followed by northward flow. The shell fragments in the upper till suggest a correlation with shell-bearing tills exposed in the Isle Madame area formed by northward flow from the Scotian Shelf. Grant's Phase C (northward flow) and the Scotian Phase are considered correlative, and Stea et al. 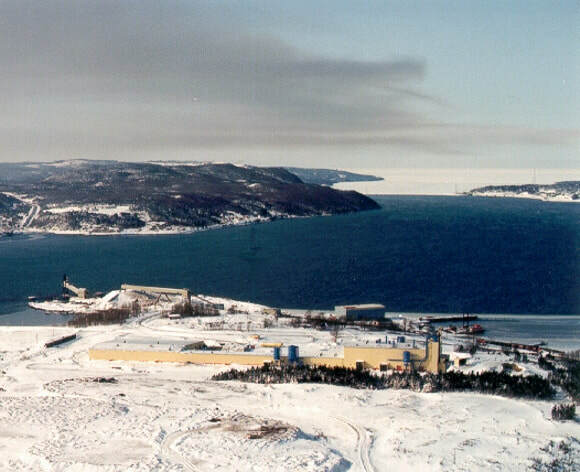 (1998) assigned the Scotian Phase a Late Wisconsinan age. Quaternary Geology, Cape Breton Island; Geological Survey of Canada, Bulletin 482, 159 p.
Palynology of a buried organic deposit, River Inhabitants, Cape Breton Island, Nova Scotia; Report of Activities, Part B; Geological Survey of Canada, Paper 71-1B, p. 123-125.